Lil Yachty is an American rapper with unique laid back druggie style of music popularly referred to as Mumble raps (Bubblegum trap). He became popular when his songs One Night and Minnesota went viral in August 2015. Both songs were from the EP Summer songs. His very first effort at releasing a mixtape was in March 2016 when he released Lil Boat. Since then, Yatchy’s career has been on a steady rise and here, we will reveal a lot of things you probably never knew about him like his real name, sexuality and others. Lil Yachty real name is Miles Parks McCollum. He was born in Mable, Georgia in the United States on August 23, 1997. He was raised by his mother Lily McCollum. 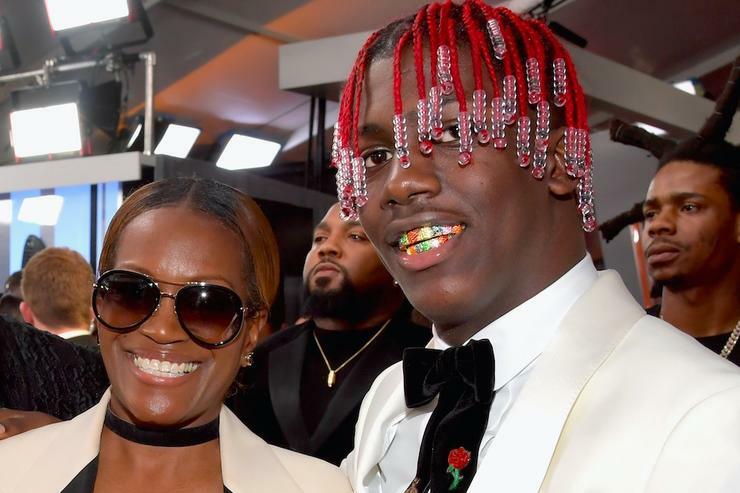 As a child, Lil Yachty was privileged to meet with Hip Hop greats, an opportunity which was made possible by his dad, Shannon McCollum who was a professional photographer and often took him to his photo shoots. Miles went to Pebble Brook High school before attending Alabama State University where he studied for a few months before opting out to focus on a career in rap music. Prior to his music career, he worked at MacDonald’s. McCollum assumed the stage name Lil Yachty when he moved from his childhood neighborhood in Atlanta to New York City. In New York, the rapper squatted with a friend while he sought opportunities in modeling with online street fashion personalities. He also began to build for himself a commendable number of fans on Instagram. In doing all these to make ends meet, Yachty was equally making music and sharing them on the online music sharing platform Soundcloud. His break came when his song One Night was used as a soundtrack for a comedy video that went viral in December 2015. Back to his modeling endeavors, Lil Yachty debuted properly as a model on Season 3 of Addidas Yeezy, fashion brand collaboration between American artist Kanye West and German sportswear giants, Addidas. This was in February 2016. Thereafter, Yachty released his mixtape Lil Boat in March of 2016. He collaborated with Shelley Mashau Massebeug Smith (DRAM), an American singer, rapper and actor on April 2016, in the creation of the hit song Broccoli which got to No. 5 on the US Hot 100 Billboard Chart that year. On June 10, the same year, Yachty signed a joint record deal with Capitol Record, Motown Records, and Quality Control Music before releasing his second mixtape Summer Songs the following month, July 2016. As he grew in popularity, the rapper featured in Kyle Harvey Thomas (Kyle) breakout hip hop single iSpy; as well as Tee Grizzlies’ From the D to the A which was released in March 2017. His debut album Teenage Emotions which featured guest appearances of popular artists and rap groups like Migos, Diplo, Evander Grim, Steffon Don, and Grace was launched on the 26th of May 2017. He Also released a couple of complementary singles dropped alongside the album, which includes songs like, Harley, Bring it Back and X-Men. On March 9, 2018, Lil Yachty’s second album Lil Boat 2 was released. On other matters, in September 2015, Lil Yachty and a friend of his were arrested at a mall in Palm Beach Gardens, Florida for credit card fraud, however, he was released after posting a bail bond of $11,000. The recording artist whose very first efforts One Night, Minnesota and Broccoli were hits has enjoyed a steady rise on the ladder of musical success. His estimated net worth is $8 Million. The Bubble gum trap rap star clearly adores his family especially his mom. He posted a YouTube video where he splashed a $1 million gift on his mother, sister, and friends (he calls gang members). Yatchy also featured her on the music video of his song Keep Sailing. He recently bought his mother a house which he shared with his fans on Instagram. He also posted a text he sent his mother thanking her for everything she has done for him. Does He Have a Girlfriend or is He Gay? Though Yachty hasn’t been too open with his love life, he is said to be currently dating an Instagram model Megan Denise. They are said to have been together since 2017. The plus-sized tattoo model subtly hinted that she was dating him in a YouTube interview on September 26, 2017. However, it has not been verified how far they have gone in their relationship. The rapper’s comment on the US gay bill and a scene on his music video Teenage Emotions generated rumors speculating that he is gay. However, this is merely a misconception of the hip hop artist’s sexuality, there are no solid pieces of evidence proving him to be queer. Lil Yatchy is not a very huge guy; he stands 11 inches taller than 5 feet (1.80 m). The rapper wears colored plaques on his teeth and shot red colored braids. Though he might not be the tallest in his line of trade, Yatchy certainly commands a lot of respect in the American rap community.